My son, Peter, probably survived childhood because of books. I read to him from the time he was an infant, and reading was always a time when all struggle ceased. (Life was perpetually a struggle for Peter in his childhood years. Much, much later I came to understand that he had Asperger's Syndrome, but the term wasn't even known when Peter was young -- at least not to me or to anyone I knew -- and no help was available for either of us.) But books created an island of serenity in a life that was anything but serene. When he was a preschooler, we sat down together to read many times a day, and when we did all else fell away. The practice continued at bedtime long after Peter could read to himself. We read The Hobbit and the entire Lord of the Rings trilogy from beginning to end. We read all the Narnia books. We read every version of the King Arthur tales I could find. We read fairy tales and legends and myths of many cultures. And when we were reading not only was Peter absorbing every word the way thirsty soil takes in water, but we bound together in mutual pleasure. That pleasure deepened our connection, despite the frustrations that bedeviled our relationship. Books, blessed us, again and again, both reader and listener. Books bless us all. They feed our souls and, when shared, bind us to one another. Our family had lots of choices for books this week to celebrate Marion Dane Bauer's birthday. I was able to enjoy On My Honor quietly by myself on the couch after the kids were in bed. My daughter was able to pick up many of Bauer's Ready-to-Read books including the Wonders of America Series . Together we read one of her Stepping Stones Books, The Red Ghost , which scared my children just enough that they were acting out the story throughout the week when they played together! Our favorite picture book we read this week was the 2010 Golden Kite Award Winner, The Longest Night. 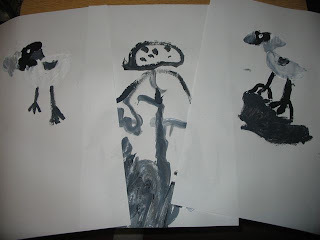 In the book, the wind chooses a chickadee to wake up the sun much to the surprise of the crow, moose, and fox. Chickadees are frequent visitors to our backyard bird feeders and are very identifiable by their "Chicka-dee-dee-dee" song. For the past year, my daughter will often carry her special "bird bag," that she received last year for Christmas, with her when we go hiking. In the "bird bag" she carries her binoculars and her Birds of Ohio field guide. She was excited to learn that her "bird book" was written by Stan Tekiela who took the photographs Bauer's The Cutest Critter which we also read this week. With all these books fresh in our mind I asked my children what they knew about chickadees and we made a list on chart paper. We then took those ideas and created a short 30 second slideshow with pictures we had taken of chickadees in our yard (Click here to view slideshow if embed feature is not working). We used the website Animoto to make the slideshow. 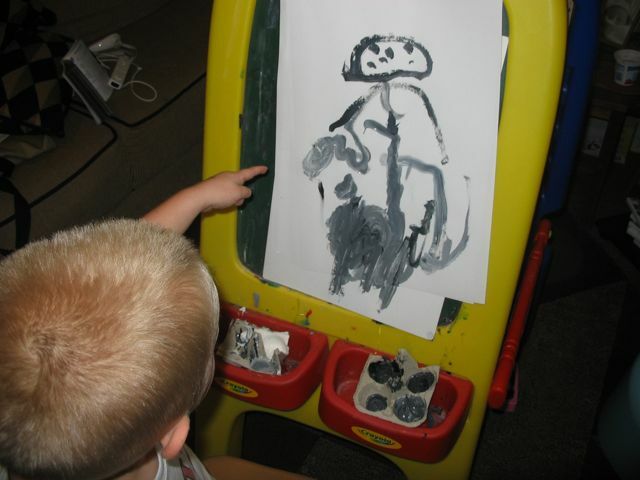 We finished our chickadee activity with a little painting. My son currently is fascinated about mixing colors. 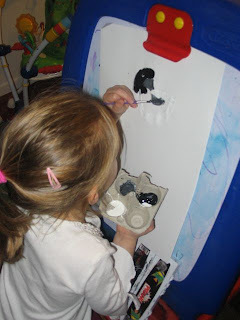 He was able to experiment with making grey paint when I gave him black and white paint in an egg carton. The personalities of my children came out in their painting; my daughter perfected all the details and my son told me an elaborate story about a chickadee flying around her nest with eggs in it. Thank you Marion for sharing why books are so important to your family. We had a great time reading your books this week. We hope you have a special and memorable birthday! I had never heard of Marion Dane Bauer. I'll have to check out her books. I had never heard of Marion either, but after the story of her son I want to pick up her books. In his earlier years my son was very similar, but as he's gotten older it's gotten better. Books have an incredible power and I love to hear how they affect the lives of the children we love. So wonderful! Thank you so much for sharing! I stumbled across her birthday and looked her up on Amazon. I recognized her book The Longest Night and decided a celebration was in order when I saw all the other books. I really appreciated the story she shared too. We had a great time reading her books. We just finished THE BLUE GHOST, last night. Great books!